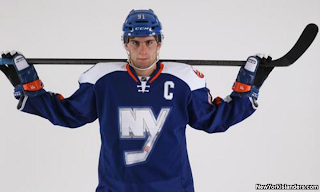 The New York Islanders were the first of seven teams to reveal their 2014 NHL Stadium Series sweater. Surprisingly, they didn’t disappoint most jersey enthusiasts. When rumours started swirling that Reebok would be using “modern” designs for the Stadium Series sweaters, people expected something bad. When Reebok tries to go “modern”, bad things happen. Just take a look at Phoenix and Buffalo’s alternates as well as regular sets for Ottawa and Pittsburgh. 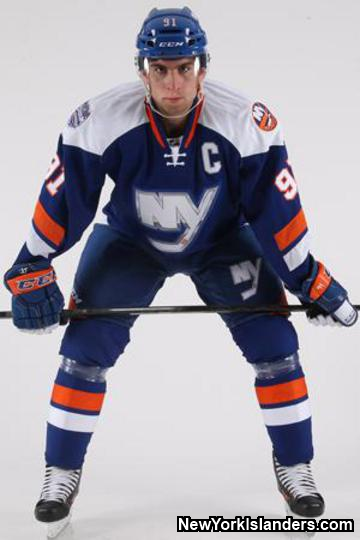 Combine those Reebok rumours with the Islanders propensity to create sweaters which their fans loathe. Sweaters such as the Fisherman jerseys of the 90’s, and their original Reebok Edge sweaters. It seemed like a recipe for disaster, however both brands surprised us with something new and modern that also works as a hockey jersey. When an Islander scores a goal at Yankee stadium and throws their arms in the arm in celebration, suddenly the jersey becomes very plain. Now it’s neither modern nor classic, it’s just boring. The next negative is the shoulder patches. On the right shoulder is the Stadium Series patch, and that is to be expected. On the left shoulder is the classic Islanders logo. Two separate shoulder logos look very un-clean and unprofessional to me. I would suggest that this sweater could have done without the classic Islanders logo on the shoulder. I think I would like this jersey a lot more if it wasn't for the chrome logo. Also the orange is unbalanced. Back and TV numbers are outlined in orange but the Captain C (and likely the A) are silver outlined. And there probably should be some sort of orange stripe at the bottom. Take away the arms, and the only orange on the front of the jersey is on the collar and the 4 little stripes on the logo. The arm stripes are weird but I can live with them. I'm usually not a fan of white yokes or a colored nameplate, but they have made it work for this jersey. I don't hate the jersey, even with what I mentioned above, I think they did a good job. The last test will be how it looks on the ice. I only HATE one thing about this jersey. The way the shoulder "yoke" doesn't connect in the back (reebok is notorious for screwing up sweaters this way... see the Avs and Panthers) not having the shoulder yoke (or sleeve striping) connect over the back of the neck bothers me big time. As it stands what the Islanders have on their shoulders is not a yoke... they are 2 unconnected white patches. If that was fixed, 7.5/10 for me. right now a 6.5/10.